The Order of the Star (French: Ordre de l'Étoile) was an order of chivalry founded on 6 November 1351 by John II of France in imitation of the Order of the Garter founded in 1347 by Edward III of England. The inaugural ceremony of the order took place on 6 January 1352 at Saint-Ouen, from which it is sometimes called the Order of Knights of the Noble House of Saint Ouen. The order was inspired by the Geoffroy de Charny, theoretician of chivalry and elite knight who ultimately earned the apex privilege of Oriflamme bearer. In part it was intended to prevent the disaster of Crécy and to this end only success on the battlefield counted towards a member's merit, not success in tournaments. By its statutes, members also received a small payment and the order provided housing in retirement. They were sworn not to turn their back on the enemy or retreat more than four steps. This last provision cost the lives of ninety members of the order at the Battle of Mauron in 1352, and at the Battle of Poitiers in 1356 cost the king his freedom when many, if not most, of his fellow knights of the Star lost their lives. The Order fell rapidly into disuse during John's captivity in London, but afterwards the nominal ranks swelled so enormously that by the time of Charles V its bestowal was meaningless. The badge of the order was a collar with a white star on red enamel; the device Monstrant regibus astra viam ("the star[s] show the way to kings") refers to the Three Kings led by the Star of Bethlehem. If an existing manuscript illumination (illustration) depicting the founding meeting of the Order is accurate, the Order's garb consisted in red robes lined with vair bearing eight-pointed black stars set with various gemstones worn on the upper left side of the mantle. The exact size of this star and the number and value of the gemstones with which it was set varied according to the knight's own choice since the star was made at the knight's own expense. The insignia also included a gold ring of which the bezel was circular, enamelled red with an eight-pointed star in white enamel at its center and extending the diameter of the bezel, while the motto of the Order was inscribed on the outside of the ring around this bezel. While the Order itself was short-lived, the use of an eight-pointed star worn on the left breast became very influential in the design of the insignia of many later orders of chivalry and still later orders of merit. The Order also had a red banner sprinkled with white eight-pointed stars and bearing an image of the Virgin at its center. "Ordre de l'Étoile". Dictionnaire universel d'histoire et de géographie, edd. Marie-Nicolas Bouillet and Alexis Chassang. Paris: Hachette, 1878. Ordre de l'Étoile, Orders of Chivalry in France. ^ In French the order was initially called les Chevaliers de Nostre Dame de la Noble Maison ("the Knights of Our Lady of the Noble House"). In Latin the order was referred to in early documents as consortium seu societatem militem Beate Marie Nobilis Domus apud Sanctum Odoenum prope Sanctum Dyonisium in Francia ("the knightly company or society of the Blessed Mary of the Noble House at Saint-Ouen near Saint-Denis in France") in a letter founding its canonical institute, and inclite Stellifere Congregationis nostre militaris apud Sanctum Audoenum in Domo Nobili ("illustrious Starbearing Knightly Congregation in the Noble House at Saint-Ouen") in a letter of June 1356, from Ursula Georges, Medieval Names of Some Knightly Orders. Chivalry, or the chivalric code, is an informal, varying code of conduct developed between 1170 and 1220, but never decided on or summarized in a single document. 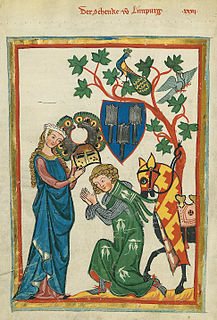 It was associated with the medieval Christian institution of knighthood; knights' and gentlewomen's behaviours were governed by chivalrous social codes. The ideals of chivalry were popularized in medieval literature, especially the Matter of Britain and Matter of France, the former based on Geoffrey of Monmouth's Historia Regum Britanniae, written in the 1130s, which introduced the legend of King Arthur. All of these were taken as historically accurate until the beginnings of modern scholarship in the 19th century. The Order of the Netherlands Lion, also referred to as the Order of the Lion of the Netherlands is a Dutch order of chivalry founded by King William I of the Netherlands on 29 September 1815. The Royal Norwegian Order of Saint Olav is a Norwegian order of chivalry instituted by King Oscar I on August 21, 1847. It is named after King Olav II, known to posterity as St. Olav. The Royal Order of the Seraphim is a Swedish order of chivalry created by King Frederick I on 23 February 1748, together with the Order of the Sword and the Order of the Polar Star. The order has only one class with the dignity of Knight, and is the foremost order of Sweden. A chivalric order, order of chivalry, order of knighthood or equestrian order is an order, confraternity or society of knights typically founded during or inspired by the original Catholic military orders of the Crusades, paired with medieval concepts of ideals of chivalry. The Order of the Polar Star is a Swedish order of chivalry created by King Frederick I on 23 February 1748, together with the Order of the Sword and the Order of the Seraphim. The Austrian Imperial Order of Leopold was founded by Franz I of Austria on 8 January 1808. The order's statutes stipulated only three grades: Grand Cross, Commander and Knight. During the war, in common with the other Austro-Hungarian decorations, crossed swords were instituted to reward bravery in the face of the enemy. An Imperial Decree of 1 February 1901 ordered that in future, the senior grade would be split into two separate awards. From then onwards, there were four ranks: Grand Cross, First Class, Commander, Knight. The Order of the Old Nobility, also called Order of the Four Emperors or Ancient Order of Saint George, is a historic chivalric order, first established in 1308. It was re-founded as a secular community on 6 December 1768 by Count Philipp Ferdinand of Limburg Stirum. The Order of Our Lady of the Thistle was founded in January 1370 in Moulins, by Louis II "the Good", Duke of Bourbon « in the honour of God and the Immaculated Virgin», at the occasion of his marriage with Anne of Auvergne, Heiress Countess of Forez, daughter of Beraud II, Dauphin of Auvergne and Jeanne of Forez; niece of John, Count of Forez. The Ancient Order of St. George, also known as the Order of the Four Roman Emperors or Order of the Ancient Nobility, is a historic secular order of chivalry. The National Order of Merit is a French order of merit with membership awarded by the President of the French Republic, founded on 3 December 1963 by President Charles de Gaulle. The reason for the order's establishment was twofold: to replace the large number of ministerial orders previously awarded by the ministries; and to create an award that can be awarded at a lower level than the Legion of Honour, which is generally reserved for French citizens. It comprises about 187,000 members worldwide.